Park City, Utah began as a mining town back in 1868 when silver was discovered in the hills. After some hard times, the economy took a turn for the worst in the mid-1900’s and Park City turned into a ghost town. That is, until a group of determined citizens decided to turn their beloved town into a ski resort. Old mining carts were replaced by ski lifts, and lift passes for the day were priced at $3.50. In their very first season, visitors totaled up a whopping 50,000 ski days that launched the boom of Park City’s outdoor industry that still exists today. Small in size but big in spirit, my recent visit to Park City made clear that the town is a paradise for outdoor lovers. 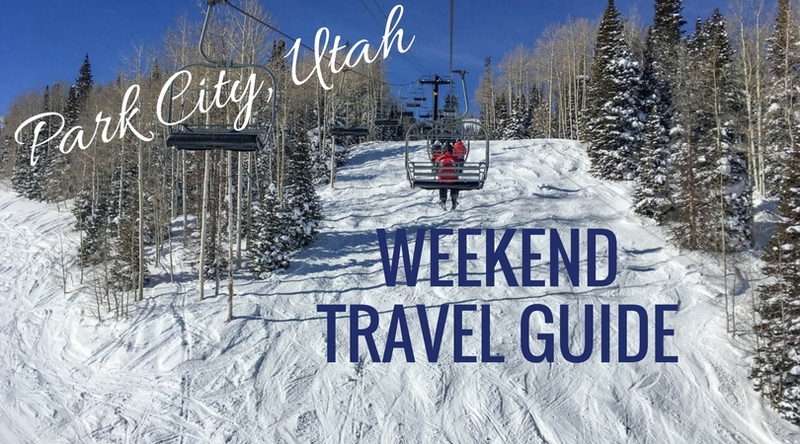 Let this serve as your guide for all the best reasons to visit Park City, Utah in winter and the top things to do while you’re there! When Vail Resorts acquired Park City Mountain Resort (PCMR) back in 2014, things got real for the skiing community. Park City Mountain Resort recently merged with their neighboring Vail-operated Canyons Resort, and the two resorts are now connected by the Quicksilver gondola, making up the largest ski resort in the United States spread out across more than 7,300 acres. Skiing at Park City Mountain is a must for winter sports enthusiasts visiting Park City. Head up to the top of McConkey’s Express for some of the best views on the mountain and look out into the distance for miles. The lift is named after Jim McConkey, an extreme skier and the father of Shane McConkey, a professional skier who took the sport to the next level by BASE jumping with skis on. Take a break for lunch at one of the many places to eat right on the mountain, such as Miner’s Camp at the foot of the Silverlode Express lift. This is also where you can catch the Quicksilver Gondola over to Canyons Village. You’ll have a wide variety of choices for your meal at Miner’s camp, including everything from Mediterranean kabobs to pizza to homemade soups and chili. Lined with shops, galleries, restaurants, bars, and a rich history, Park City’s Main Street knows how to pack a punch. You’ll find over 50 options for local fare and more than 30 galleries featuring work from both local and world-renown artists. It has been the main shopping district since all the way back in the 1800s when its primary clientele were the town’s miners. If you’re an olive oil fan you’ll love Mountain Town Olive Oil Company, where you can sample some of their 40+ varieties of olive oil and balsamic vinegar. When the sun goes down, nearly any place you walk into will be a good choice for dinner. Scope out your choices ahead of time if you can and make a reservation so you don’t have to wait too long. Conclude your night with drinks and live music at The Spur. You can’t go wrong with a drink like the “ice climber,” an energizing, eclectic mix of reek Icelandic vodka, chambers, red bull, and ginger beer. This ski-only resort is well known for their customer service, with a consistent #1 guest services ranking among ski resorts in North America by SKI Magazine readers. Deer Valley Resort is the ski destination of choice for those seeking luxury and first-class service. They offer perks like on-site child care and uniformed ski valets to make guests’ stays as enjoyable as possible. While I didn’t have a chance to ski here, just visiting Deer Valley was enough to interest me in returning for more. One of my favorite qualities of Deer Valley is how they limit the number of skiers on the mountain each day. This guarantees you won’t have to worry about overcrowding on the slopes, but just make sure to buy your lift ticket in advance, especially during peak season. Although it’s not walking distance from the ski resorts, Newpark Resort is still a centrally located place to stay in Park City that is a welcoming base to return to after a long day. To get to and from the airport, I recommend booking a private transfer with Park City Transportation instead of shuttles or other options, especially if you are bringing along ski equipment or are arriving or departing at off-peak times. While all the rooms at the Newpark Resort have glorious heated floors in the bathroom, consider their suites (highly recommended) that include perks like an electric fireplace, a kitchenette, and a private deck with a hot tub and mountain views. The upgrade is absolutely worthwhile! It is said that Utah has the “Greatest Snow on Earth,” so if you’re into winter sports you will find that Park City just might be your next happy place. The below photo speaks for itself! The Mariposa at Deer Valley is the fine dining selection when visiting Park City (read my full review here). They have a unique ordering process, where it is recommended to order three to five courses since they serve smaller portion sizes. Some of favorites include the nori and sesame seared #1 ahi, lemon thyme gnocchi, and quail saltimbocca. The Eating Establishment has been around since 1972, but it was sold recently to a group of new owners led by Modern Family star, Ty Burrell. With a prime location right on Main Street, you can score a window seat while enjoying a their all-day breakfast items such as huevos rancheros, buscuits and gravy, or Belgian waffles. Upgrade to the real maple syrup if you order the waffles or pancakes. As you make your plans for this winter, let this Park City travel guide lead the way to a memorable ski trip. This town has a special charm that makes the trip worthwhile for all to visit. The history is rich, the food is incredible, and the snow is plentiful, making for a stunning backdrop even when you’re not going downhill. Special thanks to Visit Park City, who facilitated this trip! Note that this did not affect my views and all opinions are my own. This would be so much fun! I have got to get to Park City! Absolutely! It’s one of my favorites! Thanks for sharing this travel guide. I will surely follow them all.